There are couple of articles on how to integrate Scrapy into a Django Application (or vice versa?). But most of them don’t cover a full complete example that includes triggering spiders from Django views. Since this is a web application, that must be our main goal. Looks great and simple so far. Neither Django nor client don’t know when Scrapy completes crawling. There is a callback method named pipeline_closed, but it belongs to Scrapy project. We can’t return a response from Scrapy pipelines. We use that method only to save extracted data into database. Hey! Crawling completed and i am sending you crawled data here. We can either use web sockets to inform client when crawling completed. We can start sending requests on every 2 seconds (more? or less ?) from client to check crawling status after we get the "crawling started" response. Web Socket solution sounds more stable and robust. But it requires a second service running separately and means more configuration. I will skip this option for now. But i would choose web sockets for my production-level applications. It’s time to do some real job. Let’s start by preparing our environment. Scrapyd is a daemon service for running Scrapy spiders. You can discover its details from here. 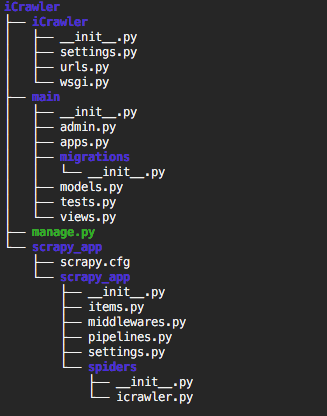 python-scrapyd-api is a wrapper allows us to talk scrapyd from our Python progam. # This is for basic and custom serialisation to return it to client as a JSON. unique_id = str(uuid4()) # create a unique ID. # This is the custom settings for scrapy spider. # We can send anything we want to use it inside spiders and pipelines. # Here we schedule a new crawling task from scrapyd. # Notice that settings is a special argument name. # But we can pass other arguments, though. # We are goint to use that to check task's status. # We were passed these from past request above. Remember ? # They were trying to survive in client side. # And if crawling is completed, we respond back with a crawled data. # Here we check status of crawling that just started a few seconds ago. # this is the unique_id that we created even before crawling started. I tried to document the code as much as i can. But the main trick is, unique_id. Normally, we save an object to database, then we get its ID. In our case, we are specifying its unique_id before creating it. Once crawling completed and client asks for the crawled data; we can create a query with that unique_id and fetch results. import os import sys # DJANGO INTEGRATION sys.path.append(os.path.dirname(os.path.abspath('.'))) # Do not forget the change iCrawler part based on your project name os.environ['DJANGO_SETTINGS_MODULE'] = 'iCrawler.settings' # This is required only if Django Version > 1.8 import django django.setup() # DJANGO INTEGRATION ## Rest of settings are below ..
## Rest of settings are below .. This will start scrapyd and generate some outputs. Scrapyd also has a very minimal and simple web console. We don’t need it on production but we can use it to watch active jobs while developing. Once you start the scrapyd go to http://127.0.0.1:6800 and see if it is working. # We are going to pass these args from our django view. # Don't forget to return an object. Above is icrawler.py file from scrapy_app/scrapy_app/spiders. Attention to __init__ method. It is important. If we want to make a method or property dynamic, we need to define it under __init__ method, so we can pass arguments from Django and use them here. # And here we are saving our crawled data with django models. Don’t forget to restart scraypd if it is working. Save the list to database over Django models. And that’s all for the back-end part. Django and Scrapy are both integrated and should be working fine. Well, this part is so subjective. We have tons of options. Personally I have build my front-end with React . The only part that is not subjective is usage of setInterval . Yes, let’s remember our options: web sockets and to send requests to server every X seconds. // django response back with task_id and unique_id. // We have created them in views.py file, remember? // this method do only one thing. // No need to make more requests. // don't clear the interval. You can discover the details by comments i added. It is quite simple actually. Oh, that’s it. It took longer than i expected. Please leave a comment for any kind of feedback.